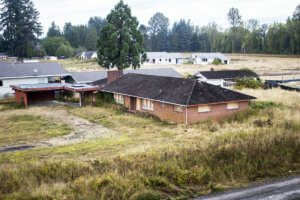 A dilapidated house sits in the planned path of the Centralia Station development. Centralia Station will be built near the end of what is currently Long Road near the Mellen Street Interstate 5 overpass in Centralia. This conceptual image provided by the Port of Centralia in 2013 shows what Centralia Station could look like when completed. As the Centralia Station project moves forward, the Port of Centralia has addressed concerns about flooding presented by citizens, stating the port hired some of the best consultants throughout the process to ensure the new 43-acre multi-use development did not exacerbate flooding. Molly Lawrence, with the law firm Van Ness Feldman, said the port hired WEST Consultants, “a highly qualified technical consultant,” to model the effects of the development on flood risks in Centralia and the surrounding areas. Lawrence’s specialty over the last 10 years includes helping clients address changes in regulations affecting development within floodplains. The Federal Emergency Management Agency’s existing floodplains are dated, according to Lawrence, and do not reflect the current landscape in regard to hydrology or physical changes such as highway improvements and new buildings. To address that, WEST used a model that incorporated the most up-to-date and best available data and methodologies. That included input from the hydrologic engineering team that worked on the Chehalis Basin Environmental Impact Statement to evaluate the effects of Centralia Station. The model, according to Lawrence, includes the recent work completed on Interstate 5 by the state’s department of transportation to reduce flooding, as well as the changes to the highway at Mellen Street. The work to address flooding concerns will continue as the project progresses. Heaton said the port has worked with the state Department of Ecology, the city of Centralia and the Chehalis River Basin Flood Authority, which ran the matter by their consultants. Following the floods in 2007, WEST worked with the Flood Authority to develop the Chehalis River Basin Early Flood Warning System. In September, the port announced the Federal Highway Administration approved a new ramp off the Mellen Street Interchange 5 overpass. It was the last permit needed before construction planning for the development, which is eyeing Fred Meyer as its anchor tenant and will also include 40 to 50 smaller storefronts, businesses and offices. The port partnered with Powell Development in March of this year after interviewing at least six developers for Centralia Station. Back in March, Peter Powell, CEO and founder of Powell Development, said the Fred Meyer would be a 172,000-square-foot store and would include a full fuel center, a drive thru-pharmacy and a garden center. According to the report from ECONorthwest last year, the $53 million construction phase of the project would require 410 full-time employees and support 575 jobs throughout the local economy, adding $26.4 million to local labor income. The construction period was estimated to contribute $4.6 million in state and local taxes. The construction is expected to trigger additional local spending, according to the forecast, which would result in a one-time impact of $76.3 million. Once the complex opened, the report estimated it would employ 535 people in Centralia at the businesses, which ECONorthwest predicted at the time would include 10 stores, four restaurants, a bank and a gas station, totaling $118 million in annual sales, according to the report. Centralia Station would earn an estimated $118 million in annual sales and pay almost $7.1 million in state and local taxes, according to the report. 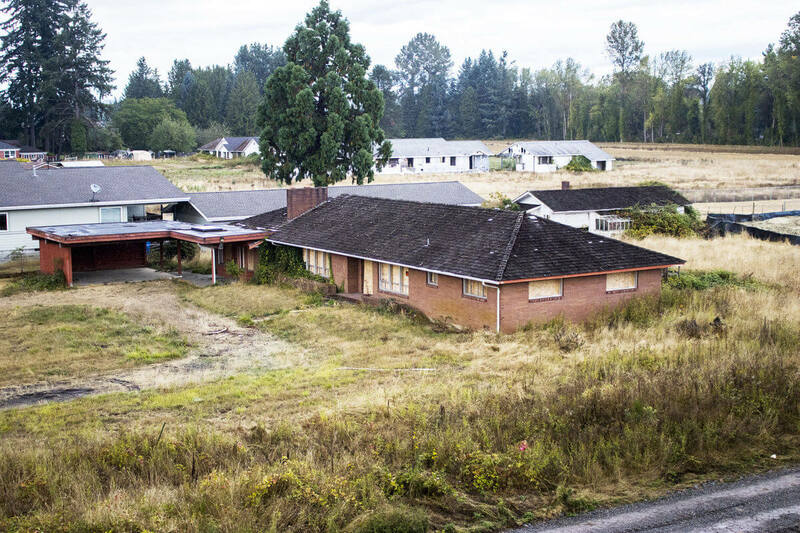 In the first 10 years of operation, Centralia Station would pay the present year equivalent of nearly $5 million in property taxes, according to the report.